Joe Panik sparked a Giants rally in the eleventh inning and Gorkys Hernandez hit an RBI double off Grant Dayton giving the Giants their first lead of the game. Mark Melancon recorded the save and the Giants won 4-1 in the eleventh inning. Before the game, the Dodgers added Vin Scully to the Ring of Honor by retiring his microphone. The ceremony was great, and his plaque has his name on it with a microphone. Sadly, the Dodgers were unable to win the game. Julio Urías pitched five shutout inning in which he struggled to find the strike zone. He walked four batters and struck out only one. He threw 88 pitches, 53 for strikes, giving him a 60.2% strike rate. He got out of a bases loaded jam in the fifth, keeping zeros on the board. Sadly, the Dodgers were unable to do much at the plate. Jeff Samardzija pitched eight innings in which he allowed only one unearned run with eleven strikeouts. He allowed only three hits, keeping the Dodgers quiet for the most part. 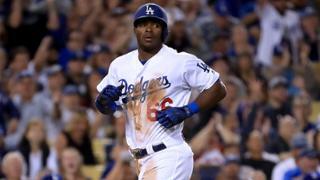 His only mistake came in the sixth inning when Yasiel Puig reached base on an error by Panik. The error allowed Puig to go all the way to third allowing him to score on a single by Chris Taylor. The Giants tied the game in the eighth inning against Ross Stripling. Hunter Pence led off the inning with a single, then advanced to third on a wild pitch. Buster Posey then brought him home with a groundout to second base. The score was tied and some of the fans at Dodger Stadium began to prepare for a long night, while others began to leave. In the eleventh, the Dodgers brought in left-hander Grant Dayton. He struggled from the beginning, allowing a lead off single to Joe Panik, then Kelby Tomlinson sent Panik to second with a sacrifice bunt. Dayton then walked Nick Hundley, putting runners on first and second. Gorkys Hernandez then doubled to left field driving in a run and the Giants had a 2-1 lead. Brandon Belt then singled, driving in another run and giving the Giants a 3-1 lead. Hunter Pence then drove in another run with a sacrifice fly when Andrew Toles robbed him of extra bases with a diving catch. Hernandez scored and the Giants had a 4-1 lead. In the fifth inning, Julio Urías got into a bases loaded jam. He allowed a lead off double to Joe Panik, then after recording two outs, walked two batters. He was finally able to get out of the inning when he got Pence to fly out to right field. Sadly, his pitch count got out of control and that was his last inning. The Dodgers caught a big break in the sixth inning when Yasiel Puig reached base on an error by Panik. He hit a lazy fly ball that Panik went out to catch in right field. The ball bounced off of Panik’s glove and Puig reached third on the error. He then scored on a single by Chris Taylor. In the eleventh inning, the Dodgers brought Grant Dayton into the game, and he got into a jam immediately. Every time that I looked into the the Dodgers’ dugout, there was nobody even warming up. Even after Dayton allowed a run, the Dodgers didn’t have anybody in the bullpen. The Dodgers didn’t even think about sending somebody in to get the Dodgers out of the inning. It seemed like they decided that they were okay with giving up three runs in the eleventh. The Dodgers have a scheduled off day on Thursday, then they open a three-game series against the Padres. Kenta Maeda will start for the Dodgers and Jhoulys Chacín will start for the Padres. Joc Pederson will return to the Dodgers, but they have not yet decided if that means they will send Cody Bellinger back down to Triple-A. The game will start at 7:10 pm PT and be televised on SportsNet LA.